I’ll leave the religious and philosophical ruminations to others, but I rather like where this Monarch caterpillar chose to metamorphose. At the very least I should explain why there’s a Monarch chrysalis indoors. My son is starting his life and lives far away–sniff! and yay! at that, depending upon my particular mood. He will probably never live at home again and I’m in the process of revamping his room into something more usable. Adding to that, the predicted freeze-that-wasn’t last week spurred me to prune some milkweed with 8 Monarch caterpillars in residence. 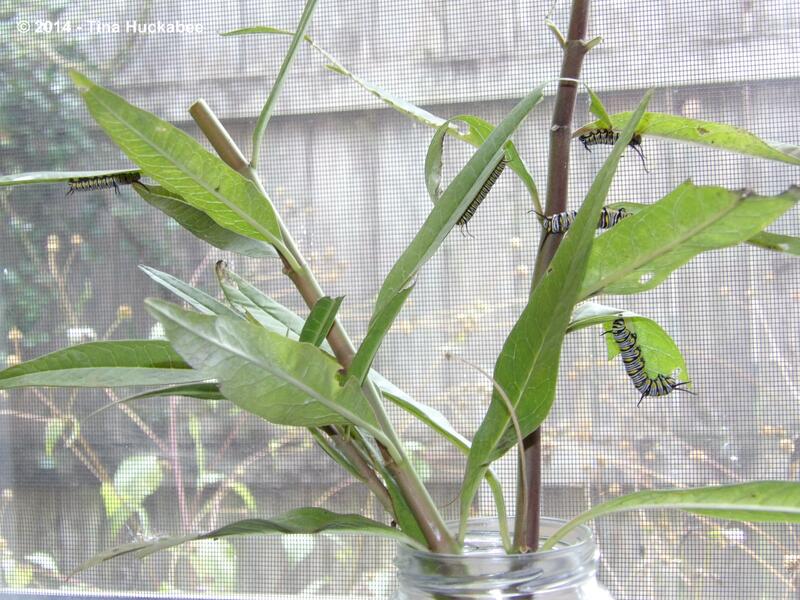 I placed the milkweed, with accompanying caterpillars, in jars on my son’s bedroom window sill and am letting nature take its course. As of today, there are three chrysalides and five more eating their way to transformation. What can I say? 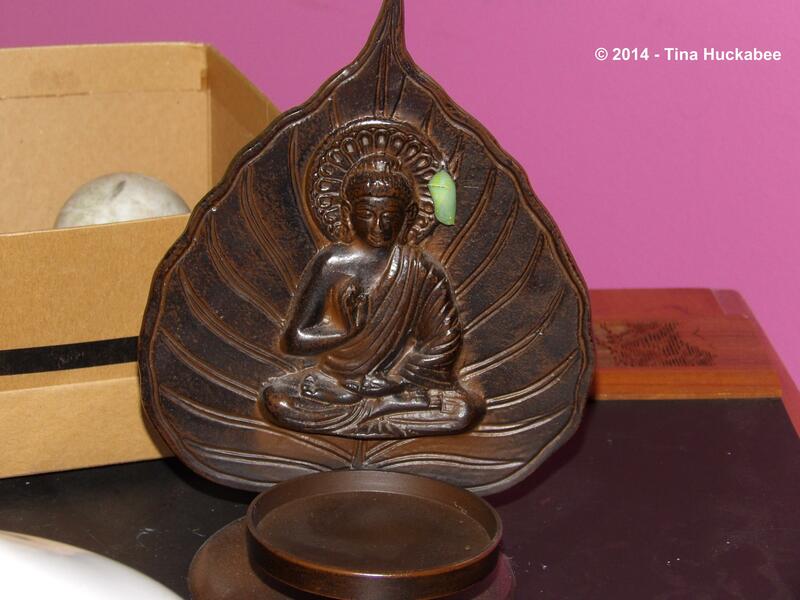 The parallels of butterfly metamorphosis and Buddhism are too obvious to ignore. My sister-in-law suggests the creature which emerges will be a Buddha-fly. I think I like it. This entry was posted in Monarch caterpillar, Uncategorized and tagged Monarch, Monarch caterpillar by Tina. Bookmark the permalink. That’s wonderful… Buddha-fly… I’m pretty sure any one of those photos would capture the prize in any sort of contest I can imagine. The juxtaposition is too randomly appropriate to feel random. And don’t even get me started about you incubating butterfly babies in the room your son so recently vacated. This is already the beginning of such a beautiful short story. I hope you won’t neglect to share the ending with us. I couldn’t let them freeze (though they wouldn’t have last week–this morning, maybe, as there is ice on the birdbaths–I covered nothing btw!). So I thought–what is there to lose?–for them, I mean. I’ll release them when it’s time, there should still be a few things to nectar on, if not, I can feed them sugar water. They will probably migrate south, since that’s what they’re programmed to do. I’ll never know if they make it to Mexico, but they have a chance and that’s better than leaving them to become larvae popsicles. I didn’t really consider the connection between my son’s transformation and the insects’ transformation–too focused on how to keep the caterpillar poop cleaned up, I guess. And, I’m sure there are a couple of posts in this little science experiment. I thought of your St. Francis belt accessory from your recent Wildlife Wednesday post–who would have thought?–religious icons as nature fashion mavens! Your sister in law is too clever. =) My son is around that age too. Bittersweet. I don’t think you ever need to worry about a chrysalis freezing outside. The cool temperatures and short day length of winter keep them in a state of diapause. It is a fun project to bring them inside to watch the process. I’ve done it with kids before and it is truly magical. I couldn’t find specific to Austin information about how the caterpillars would handle a cold snap or the winter as a whole, so I opted to bring them in and let them do their thing. When my kids were little, we hatched Bordered Patch butterflies a couple of times and I agree, it is quite magical to observe the metamorphosis process. How long do they take to pupate? How exciting, I hope you will keep us informed of their progress. It’ll be 10-14 days. It’s interesting because the dramatic transformations occur over short periods time. I came home last night, turned on the light and one that had begun to form into a chrysalis, was writhing like a hula dancer. The shell was the signature green, but wet and glistening and the “head” of the caterpillar was still attached. In the time it took me to walk to an adjacent room, grab my camera and walk back, the head had dropped to the ground and there was nothing but green chrysalis. It slowed down its gyrations shortly afterward. I hope I can catch at least one of them emerging from the chrysalis, but time will tell. And I do plan to document the process. Utterly beautiful story under Tina’s ever watchful eye !! I hope to capture some, if not all, as they morph into chrysalis form and then to their adult selves. They probably would have been fine, but I’m glad they’re in and that I can watch this remarkable process. 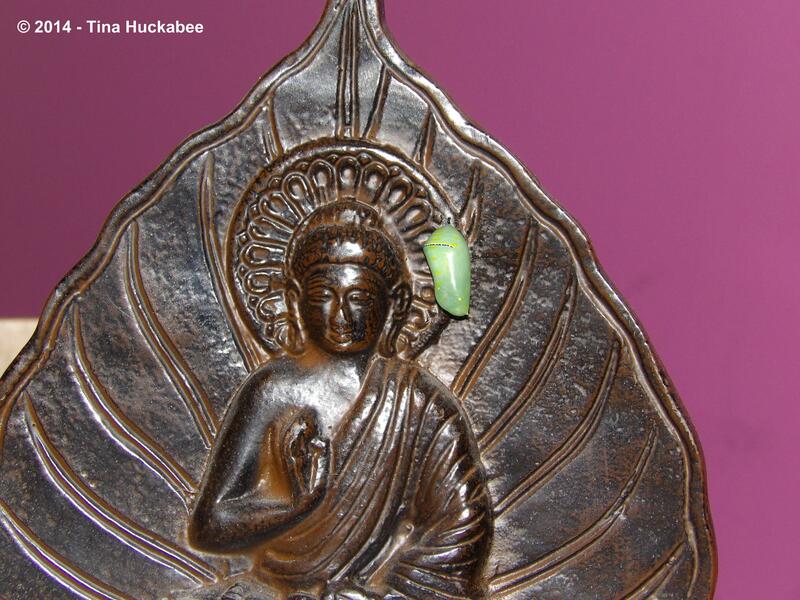 Buddha-fly has gone over big!